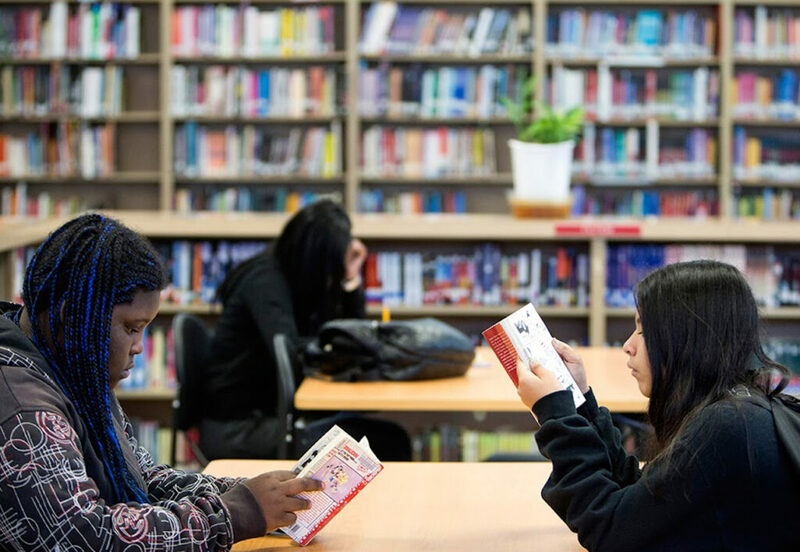 Students work in the library at Skyline High School in Oakland. Gov. Jerry Brown has quashed an effort to mandate later school start times in most middle and high schools by vetoing a bill that would have banned starts before 8:30 a.m.
Lisa Lewis, spokesperson for the nonprofit Start School Later California, which supported the bill, said she intended to continue advocating for later school start times throughout the state and would support another bill in the Legislature. The bill picked up steam this year when it passed the Legislature and was sent to the governor, after failing to win enough votes in the Assembly last year. Lewis stressed that a state law is needed since most districts in the state have an unhealthy start time of before 8:30 a.m. She pointed to a 2011-12 study by the Centers for Disease Control and Prevention that reports that nearly 80 percent of schools start before 8:30 a.m. 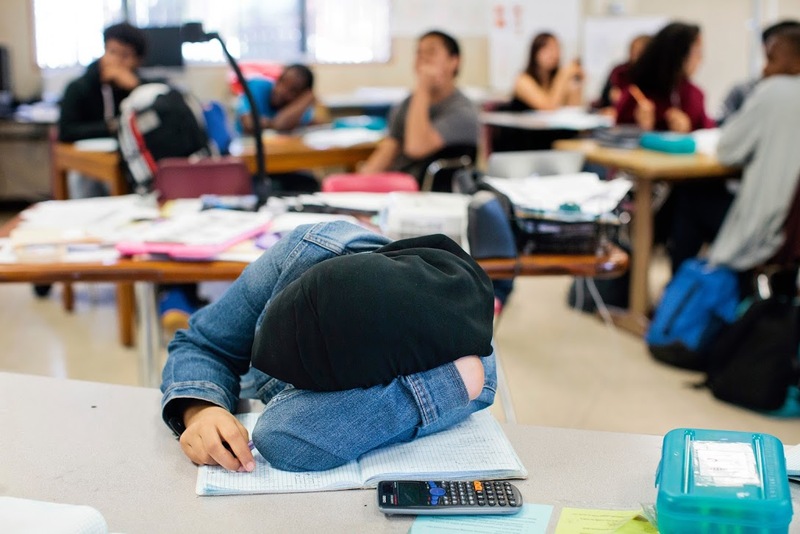 The Centers for Disease Control recommend the 8:30 a.m. start time based on research that shows teens undergo biological changes when they reach adolescence that makes it difficult for them to go to sleep early, resulting in sleep deprivation that can contribute to poor attendance, lower grades and graduation rates, depression and other health issues. The California Teachers Association, which opposed the bill, was “pleased” that Brown stuck to his support for local decision-making in individual districts, said CTA spokeswoman Claudia Briggs. 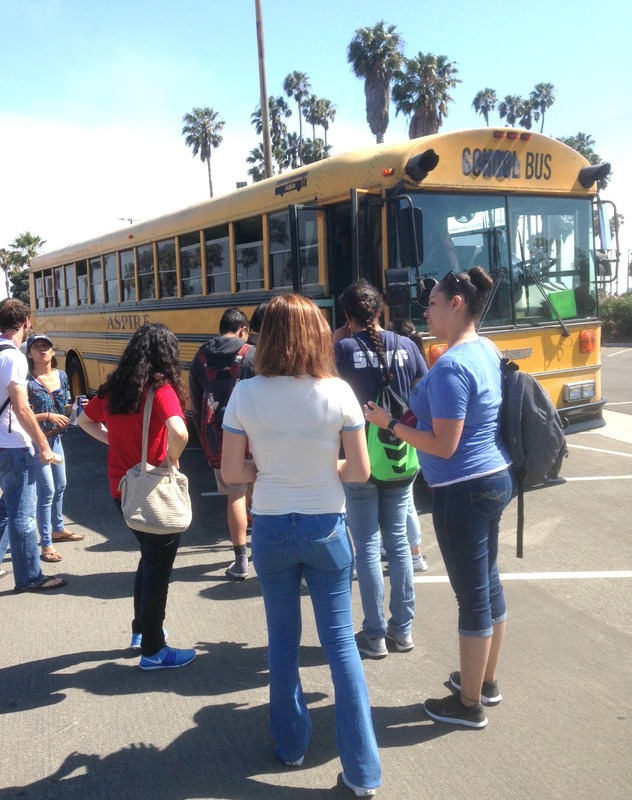 Now, the average school start time for California’s more than 3 million public middle and high school students is 8:07 a.m., according the Centers for Disease Control study.The bill would have allowed districts to continue to offer optional “zero periods,” which are extra classes students can take voluntarily, before 8:30 a.m. It also would have exempted rural districts. This wouldn’t be a problem if we stay in standard time starting this November! I’m curious about what efforts she and her organization have made to advocate for this at the local level, and if they did make those efforts, if there is any feedback for why they were rebuffed. I stood by Governor Brown while he advocated for LCFF and local decision making, and later while he signed the bill into law at California Middle School in 2013. I believed in the importance of more local decision making for school districts then and still do. Any parents with teenagers know, they are different at 7 am then 8 am and that’s before you get to the science. Are later start times less convenient for adults? Sure. But who are we trying to educate – children! Governor Brown blew it on this one. Let’s hope whomever is elected in November does what’s best for kids. CTA has done their members a disservice. Opposing the bill by hiding behind “local control” leaves the students and families in California unprotected and ignores decades of public health science and many benefits for students and families. This bill didn’t remove local control — Districts would still have been able to arrange schedules in a variety of ways, including unfortunately the continuation of the harmful practice of allowing a “zero period.” Students and families are left unprotected with no options–forced to comply with current, science-denying start times that have been shown to do harm to young people. Shameful.